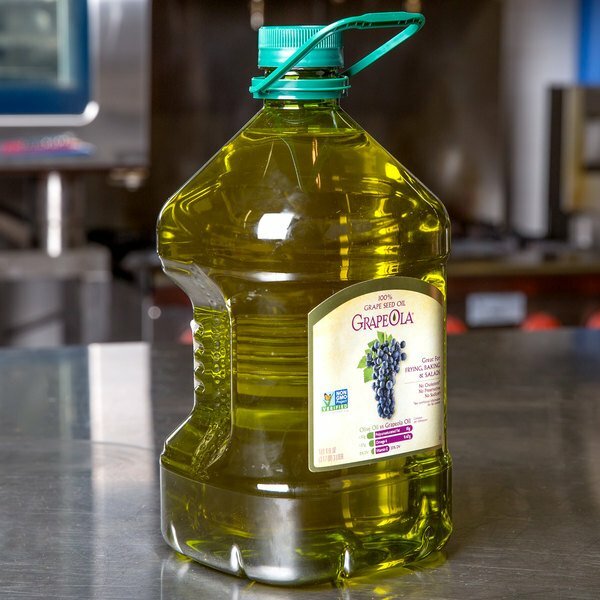 This Grapeola 100% grape seed oil has a clean and neutral flavor, making it a valuable type of oil to have on hand for a variety of dishes! Use it for cooking and baking, or whisk it into salad dressings and marinades. Safe for temperatures up to 420 degrees Fahrenheit, you can even use it for pan frying and deep frying without smoking or burning. Since it's preservative and cholesterol free, it makes a healthier alternative to other traditional frying oils. Pressed from the seeds of grapes, this oil is a natural by-product of wine-making. Its light taste won't overpower delicate foods like chicken or fish. With its versatility, you'll find plenty of uses for this bulk supply of grape seed oil! This Grapeola 100% grape seed oil is wonderful. it is a high quality oil, while being very affordable. We had been purchasing grape seed oil elsewhere for years but no longer. I don't even bother getting my grape seed oil anywhere else anymore. This Grapeola oil is not only very high quality, but it comes at a fantastic price. I've used it for sauteing and making dressings and it works great every time. The oil is really good. Can use at high temperatures and gives the food an awesome taste. I use it with everything i make. Thanks webstaurant. I love this oil! Grape Seed oil is naturally neutral in flavor and high-heat, ideal for a variety of cooking and baking applications. I'm just finishing my second 3 Liter container of this oil and am ordering another. It's a great product at an incredible price that I highly recommend. This grape seed oil is super affordable and delicious! It has a higher smoke point than olive oil and others, and the flavor is great! We like it best for stove top popcorn, but we use it for all cooking. We love this to make our house salad dressing and it is just wonderful. It great when we use it for the company stir fry does not muddy the flavors of the food. This is a great oil at a great price. I use it not only for cooking but cold processed soap as well. Itnisba great deal. This oil is very versatile and has a very high smoke point. It's a great substitute for olive oil but lightly in flavor so it won't affect your end product. We use it when making a marinade for some of our grilled products and it works well. The price is also very affordable a high quality non gmo oil. GrapeOla is the cooking oil I am always looking for: pure and excellent quality, high smoking point which you could cook basically for everything, from salad to deep frying. I did several group purchase for a group of people with the purpose of saving cost by sharing shipping cost and group discount. This cooking oil is the favorite for most of my friends. 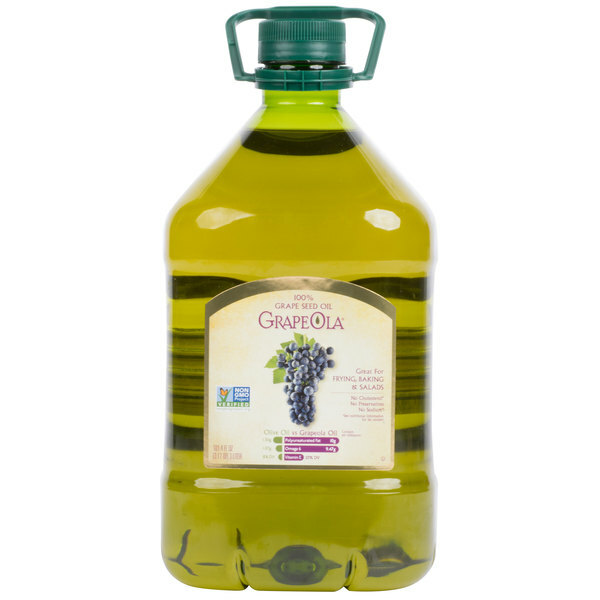 The Grapeola 100% Grape Seed Oil - 3 Liter is an OK item, I was concerned since part of my label was torn off so I couldn't see a visible best by date but I used it for frying and it's virtually taste-free and has a high smoke rate which is nice. A nice healthier alternative to frying and sautéing. The oil is great for high heat and is light and fresh tasting. A great buy for the large 3 liter bottle. This is a great price for grapeseed oil. I like it because it is healthier and it has a high smoke point. I will definitely come back for this value. This grape seed oil is awesome, use it for so many things, the price is also right, quick delivery as usual. Thank You so much! The best brand out there!!! I love GRAPESEED OIL. People need to replace their cooking oils with this one because it is not only good for you, but makes the food taste heavenly! 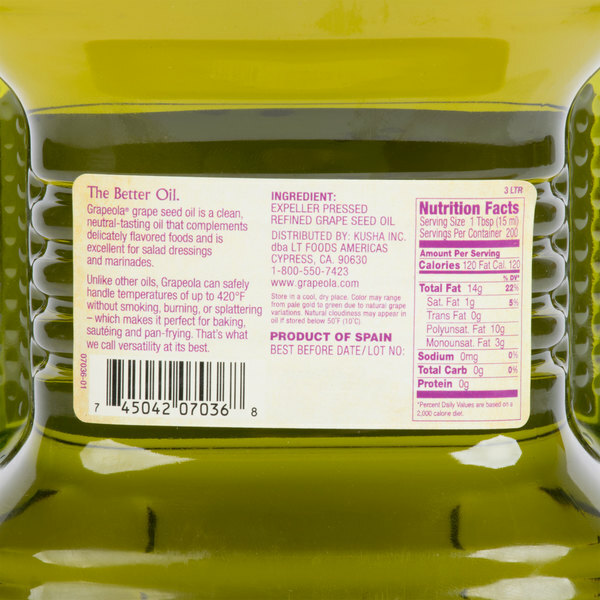 This grape seed oil is a great healthier way to cook. It is also a good value for the price. Will definitely buy this again. I had no idea we would go through so much of this! I read that Grape Seed Oil is one of the best oils to Stir fry in, and we have been cooking stir fries to satisfy everyone's individual tastes in the house, but I never tried Grape seed oil before. No weird or fruity taste, just a much healthier oil! This is what I came back to order. We use this now instead of olive oil for cooking. grape seed oil is the best in terms of neutral flavor and smoke point. it's a great all around oil and normally is very expensive. this large container is a really good deal.